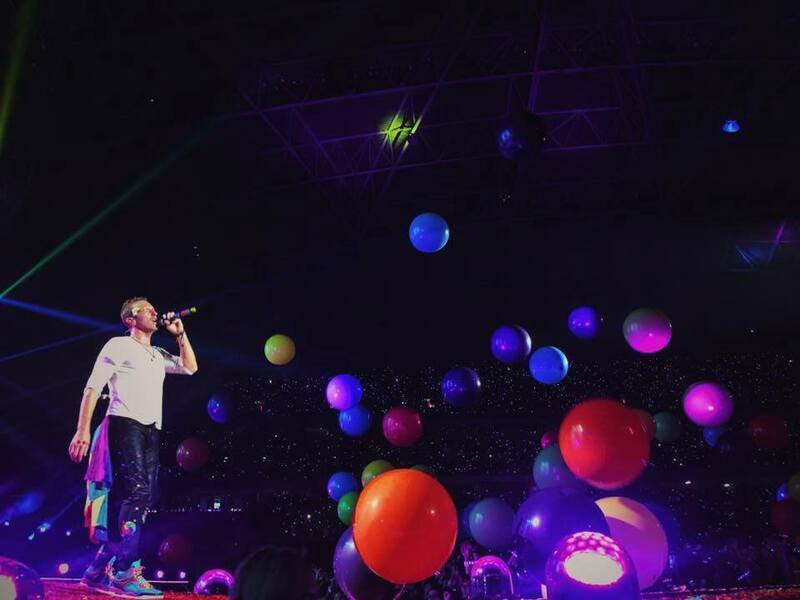 10 Filipinos share their adventures of a lifetime catching Coldplay around the region. 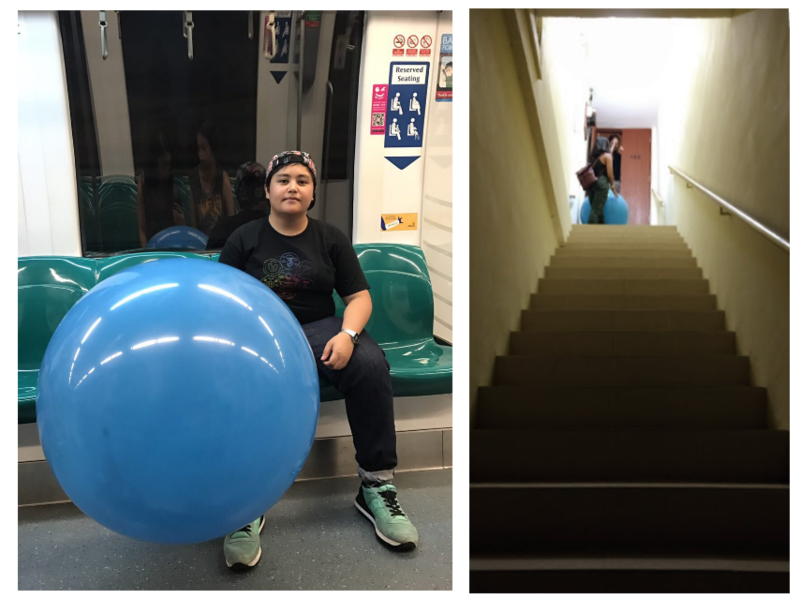 Part 1, from Singapore and Manila, features spontaneous flights, sunrise queues, strange souvenirs, and a beautiful moment of pride. Time-in at the venue: 10:00 a.m. Started crying: "Fix You" and "Everglow"
Why Singapore? Weeks before they announced their Asian Tour, I was checking every website to see if there's an event near me. I actually prayed for it. And the universe conspired! But I was disappointed to see that there was no Thailand on the list. My friends and I decided to go to Singapore instead. We saw it as an opportunity to travel. Making the "I love you" sign. 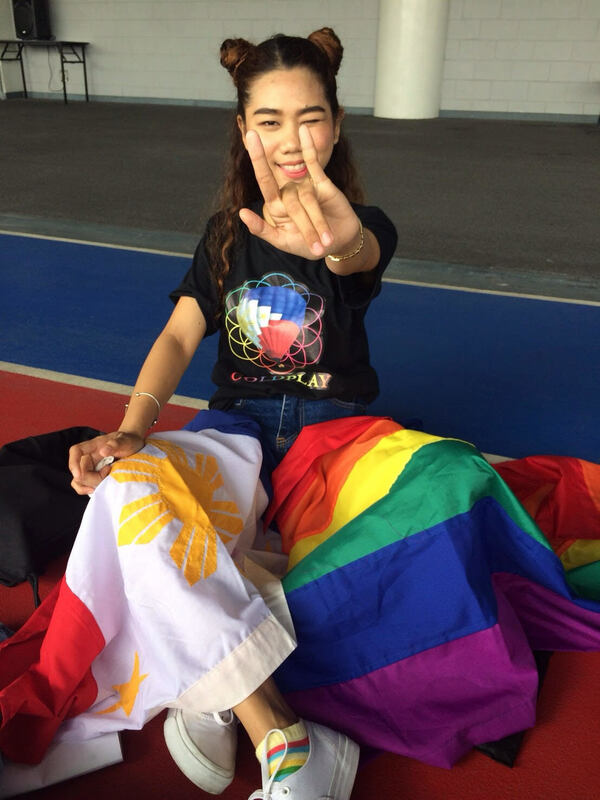 I was still holding the pride flag together with the Philippine flag. How did you get tickets? My friends and I tried the online pre-selling and the actual online selling, but we all ended up failing. We were so frustrated that we wrote emails and DMs to organizers complaining about scalpers, and requested to add a day two or add a Thailand date. Haha! I think a lot of people did the same because they announced a day two schedule and a Thailand date. A friend who was in Singapore decided to line up early in the morning at a mall, where we finally scored tickets! At which point did you cry? I was misty-eyed for the most part, but I cried my heart out during "Everglow." Chris instructed us to think of a person to whom we wanted to send positive energy. I thought of my dad. He has Stage IV lung cancer. I was so emotional; I was ugly crying. Right now, my family is going through a difficult time. When I told them I'm going to Singapore to see Coldplay, they did not hold me back. My family sees me as a ray of sunshine, and my sister told me to refill my cup of happiness so I'll have more to shower onto them. Attending the Coldplay concert was the perfect way. When my family learned about CM trading my pride flag for the Love flag, my siblings told me my dad was so happy and was very proud of me for being brave. We all talked when I came home, and it gave me the affirmation that although my mom doesn't fully accept my preference, all of them just want my happiness, and that no matter what, they will always be there to support me. I also received thanks from random people. It's overwhelming. I always stand firm on what I believe in, and I love Coldplay for doing the same. The act of trading flags holds a powerful statement, and I hope people got the message. I'm empowered to continue what I'm fighting for. I'll forever treasure that night. Time-in at the venue: 9:45 a.m.
More than their songs, I live for Coldplay's integration of creative tech to their brand, i.e. Xylobands, Reactables, Laser Harps, innovative and surreal music videos. They are proof that there can be more to music than just the music, that the industry will only grow, and that my dream of touring with a band is a valid career. Went with my college blockmates, Tin and Carebear, on our first self-funded international trip! Why Singapore? No way am I splurging on a full production only to watch it in a flat parking lot. By the end of our 6-day 7-night trip, I spent a total of PHP 27,700—comfy flights, cool hostels, tourist traps, overpriced bars and all—just PHP 4,000 more than a VIP ticket in Manila. Here are my friends with Bluey because yes, this happened; yes, he has a name; and no, this is not our craziest story. On the midnight train back to our Airbnb, we met a Finnish mother and son who also came from the show. They asked Carebear to sing a Coldplay song, and they gave her the AHFOD 2017 Tour shirt. Official merch. From the long lines. For free. And then they got off at the next station. We know nothing else about the kind strangers, except that one went by the name of Samurai. At which point did you cry? For the first time in my live music life, I was quiet and still when the lights dimmed and the music kicked in. I couldn't find it in me to move, sing, nor raise my hands. In between the jumpy silhouettes, I saw the sempiternal flower of life forming and 50% of Chris Martin on screen and nope, I refuse to watch Coldplay this way. I wiped my tears, gave up the spot I lined up 16 hours for, stepped out of the crowd, and finally, saw everything: the stage, the visuals, the full effect of the ‘bands as they lit up in starry yellow, the amount of people around me... Everything. I was shaking, and crying, and walking back and forth, and looking up, and looking around, all while hearing thousands sing bittersweet hooks like "look at the [xylobands], look how they shine for you" and "nobody said it was easy." I have never felt that inspired. I spent the rest of the night clutching the tour book in my arms, next to the lights/video booth, where I observed the team manage four giant screens, and manually adjust the lights to the music. The last page of the tour book filled my heart with so much joy. Next to it is another doodle, 8 hours later, which I used to get me the last copy of the setlist from the sound crew. I've always known that my dream is a ridiculously high hope, and for the past year, as I took in more corporate gigs to survive, I've slowly accepted that maybe shooting concerts as media is as good as it gets. But experiencing this show, seeing how a great number of the team are women (! ), and briefly chatting with the generous people behind it, suddenly, the dream felt possible again. Time-in at the venue: 6:00 a.m.
Why Singapore? Between flying to Manila and to Singapore, the latter wins in a heartbeat because of the ticket prices, the venue, and the chance to catch up with friends. It’s been a while since I last watched a show here, where I always end up finding Filipino concert buddies! 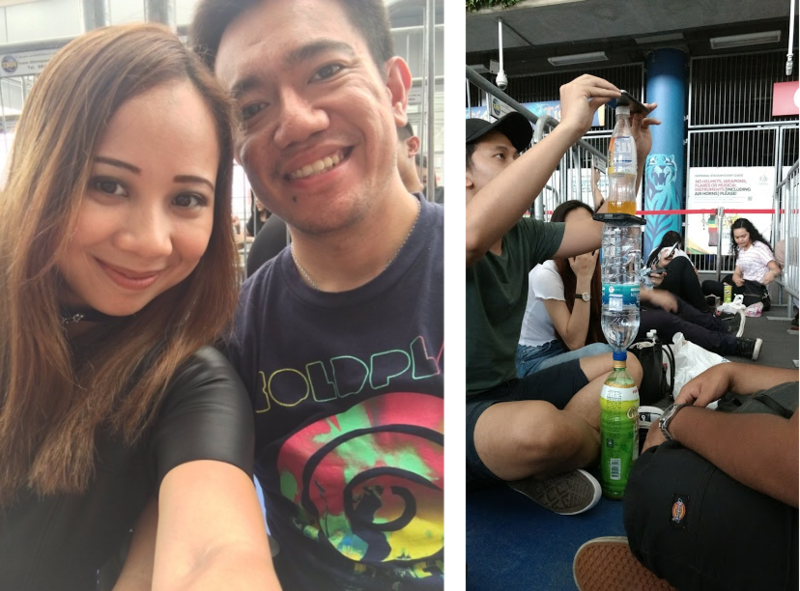 I was second in line at the VIP gate (left), only bested by SG-based fellow Filipinos, Gizelle, Sam, and Ninia (right), who arrived at 5:00 a.m.
Coldplay is one of my longest music love affairs. Their songs have been a staple in different chapters of my life—whether I'm at my happiest or when I needed to be reminded that the world is still a beautiful place. This was taken by my sister during the show, who probably cried more than I did the entire night. It's been a tough year and this was an experience that gave me peace of mind. 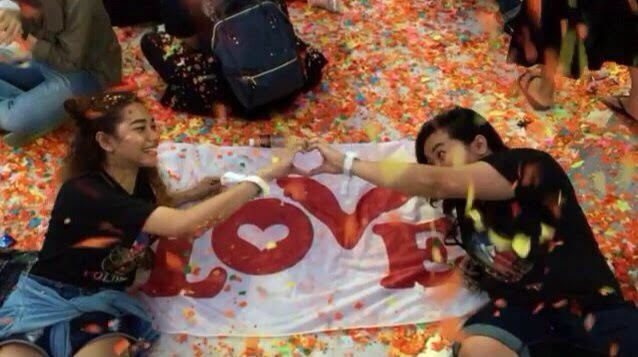 Hearing them live was a healing experience, one that took me across time and space—across countries to be reunited with old memories and friends, and come across new acquaintances from such a diverse group with a common love for Coldplay. Time-in at the venue: 2:00 p.m.
Coldplay got me through most of my high school and college dramas, oh and through the most painful and emotional TV show finales (yes, I'm talking about The OC). Why Singapore? Watching a concert in itself is an experience, but watching it in another venue with world class facilities doubles that. The prices in Singapore were cheaper than in Manila for the same seating class, and I got to have a mini-vacation in parallel as well. How did you get tickets? The first date (April 1) got sold out fast, so when they announced a second date (Mar 31), I set my alarm 15 minutes before and during the ticket release time. I opened so many browsers even though I was told not to. The first time I got to book tickets, I lost them because I took too much time logging in my payment details. But very, very luckily, I was able to book tickets a second time even with the heavy internet traffic. My boyfriend and I joined the queue at 2:00 p.m., and the line to Standing Pen A was already so long. People were actually pretty comfortable in their spots. I even saw a girl working away on a laptop. 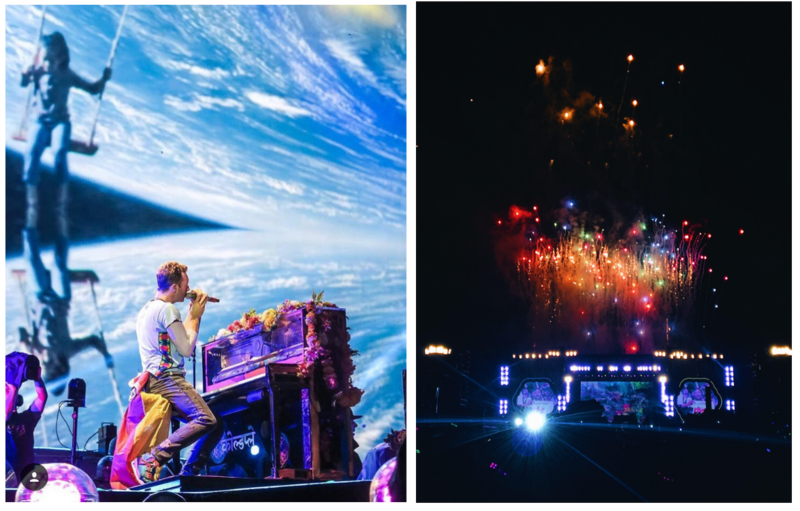 How does it compare to the Mylo Xyloto Tour? The setup is pretty much the same—A-B-C stages, props (confetti, colorful crowd balls), and production (fireworks, on-stage pyro). A major difference is they played "The Scientist" and "Yellow" early this time. And that the fireworks were more visible during the Sydney show. But the vibe is still the same. It still felt like it was one big Coldplay party. 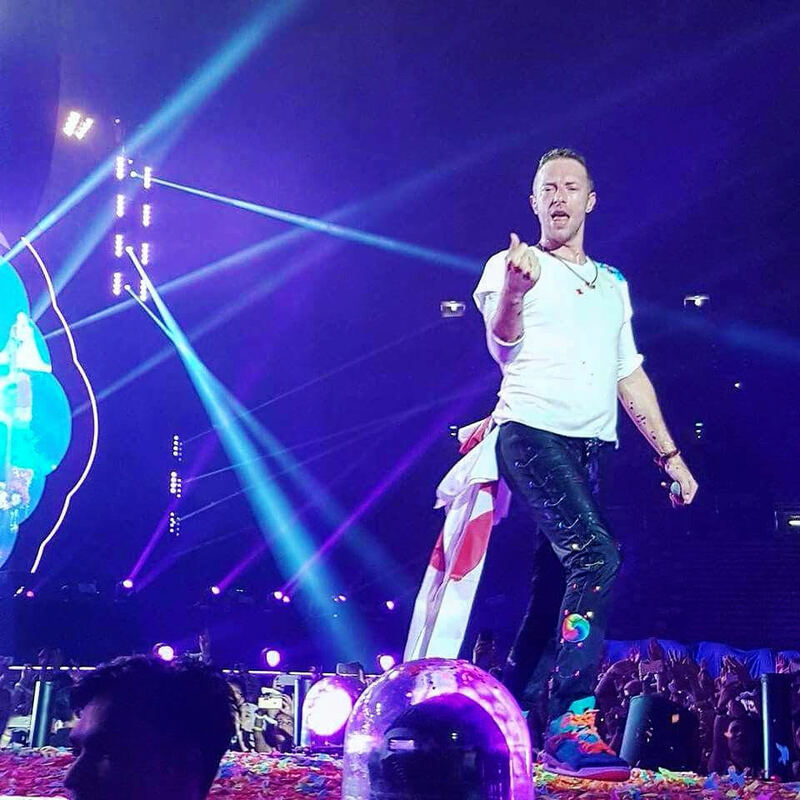 During one of the last songs, Chris Martin ran up to our side where I could see him clearly. It felt so surreal that I was standing there and he was just a few meters away from me, singing this song that I would normally play over and over in my car on my way to work. Now, it's live. The photo doesn't show it, but the stadium was raining star-shaped confetti during this song. That moment was everything. It was all was worth it—the time, the money and the pain in my feet. Coldplay has been my magic since I was a teenager and it still is. Time-in at the venue: 6:00 p.m.
Coldplay means the world to me. I still remember the moment I fell in love with them, when I first heard "Yellow" on MTV. Their music helped me through the worst and best of times in my life. From moving on from failure in school, to just plain enjoying life when I travel, their music just speaks to my soul and heart. There wouldn't be a day I would stop listening to their music. I've been dying to meet them ever since, and my goal is to watch them in all the continents of the world. Why watch in Manila again? Me and my cousin Jaime went all the way to Japan in 2014 to watch their concert, but failed to do so because the tickets were given in a lottery. It took me two years to travel all the way to Europe to watch them for the first time, and my love for Coldplay just grew fonder. I would never miss the chance to watch them again, especially in my home country. Hamburg vs. Manila. I stayed farther this time to experience the crowd. We got to the venue at night, but we were not in a rush, because we just wanted to take it slow so we could appreciate everything and remember the feels we had when I watched in Germany and he watched in Chicago last year. No doubt that AHFOD Manila was the best. 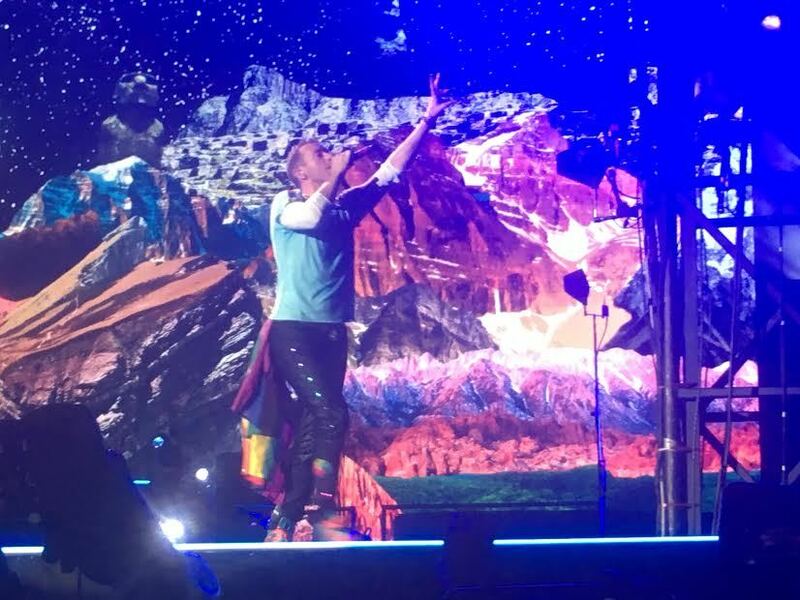 Coldplay playing in the country I was born in was already amazing enough, but sharing and singing the songs of the band that I love the most with the people I love made everything a million times better. Time-in at the venue: 6:30 p.m. Started crying: "The Scientist", "Fix You", and "Magic"
Coldplay has helped me come into terms with my emotions. "Magic" made me relive the first time I hopelessly fell in love, "Fix You" reminded me of when I couldn’t understand what the love of my life was going through, but I desperately wanted to help her, and "O" taught me to let go, even if it pains you to, because if it hurts, it means that it mattered. To have guidance through their music is indescribable—Coldplay’s my hero. How did you get tickets? What made you decide to watch last minute? Oh, man. You might want to sit down for this. On the morning of April 4, I was comfortably sitting in one of the waiting areas of Ninoy Aquino International Airport. I was in Manila, ready to board a plane back to Dumaguete, where I worked. My flight was delayed, so trying to kill the time, I scrolled through Facebook, where I stumbled upon a video of a Coldplay concert. While watching it, I completely zoned out. I got lost in the music and the visuals. The concert looked like magic. I thought about going to the show when I first heard about it, but things were kinda tough for me then. While I sat there, one question circled my mind: Should I? First of all, my week was filled with work. Secondly, I had no plane ticket going back, and most importantly, I had no ticket to the sold-out show. The concert was a few hours from now. I couldn’t possibly do everything in time. It’s too late... But also, I couldn’t miss this. It's their first time in the Philippines. Adrenaline took over as I dialed my boss’s phone number. I couldn’t back out now. As tempting as that sounded, I declined. The company paid for my flight, and I still had work to do there. He understood, told me to take care, and before he hung up, shared that he was going to see the concert with his wife. It was already noon when I arrived in Dumaguete. I hurriedly booked myself a flight back to Manila for 3:40 p.m. I then called a friend and asked if he could find me a concert ticket. On the way back to the Dumaguete airport, I prayed to every existing god that my friend finds me a ticket. It was already minutes before my flight, and gates were about to close, but at the strike of 3:00 p.m., he called to say he found not one, but two tickets. I couldn’t believe I was here. The tears started when I heard my favorites, especially "Magic." When Chris started singing, I was already tearing up. But when he changed the lyrics from "I call it magic when I’m with you" to "I call it magic when we’re with all of you", that’s when I lost it. All my life, I’ve been hearing these songs on my phone, on YouTube, on radios, or at parties, but now I’m hearing it live. Coldplay is in front of me, playing the songs I’ve been singing along to all my life. Everyone sang along like they’ve lived through these lyrics, and maybe they have, like I did. Has the show changed you in any way? Not just the show itself, but what happened before and after the show has definitely made such an impact on me. I had to be brave enough to take a chance, which turned out to be one of the best decisions of my entire life. 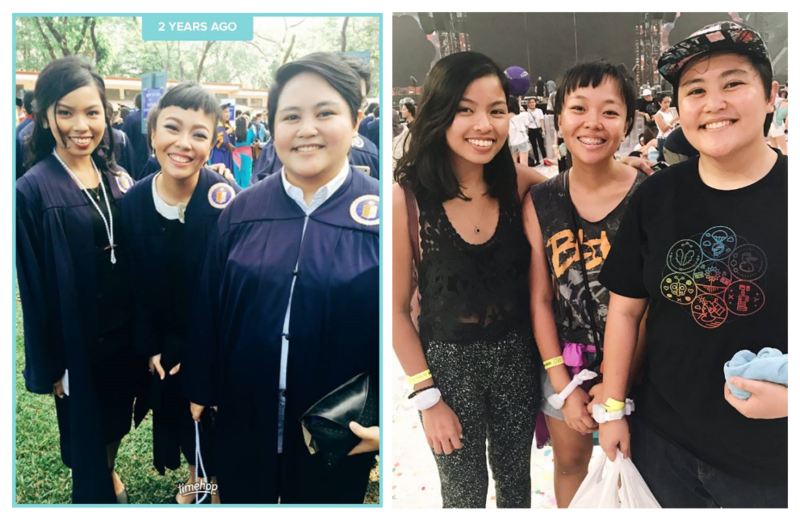 I was happily drowning in the music the whole time, but when I saw friends in each other’s arms, couples kissing, families bonding—it was a celebration of life and the people that go through it with you. You choose who you see the world with, and in that moment, I saw the world through Coldplay. After the concert, I saw people crying, taking pictures, and still singing their songs. Genuine happiness spread through their faces, smiles as bright as the lights at the venue. Being able to see the magic that music can do to people... It’s enchanting. Coldplay did not disappoint. I doubt they ever will. 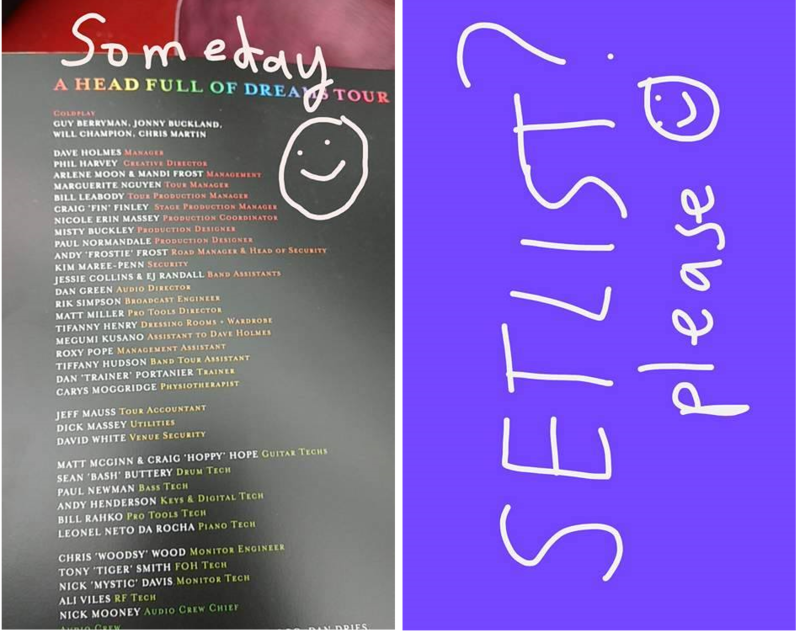 Coldplay's A Head Full of Dreams Asian Tour, as told by Filipino fans Part II will include stories from the rest of the AHFOD Tour - Bangkok, Taipei, Japan and Korea.